Japanese game developer Cygames, Inc. announced today that it has established a memorandum of understanding on joint research with the Center for Research in Entertainment and Learning (CREL) at the University of California San Diego Qualcomm Institute. 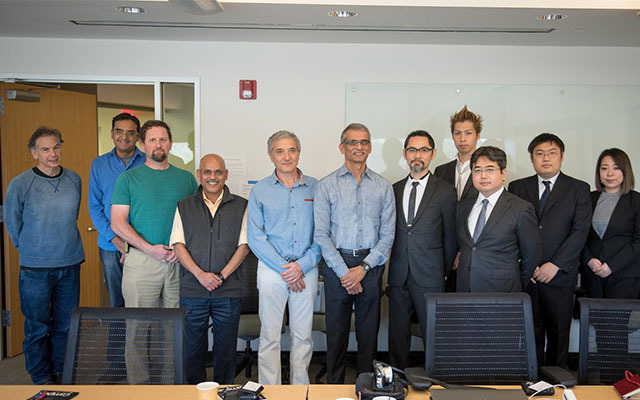 Cygames Chief Technology Officer Eitoshi Ashihara and Prof. Shuichi Kurabayashi, director of Cygames Research, visited UC San Diego last month to establish a memorandum of understanding with Prof. Shlomo Dubnov, the director of CREL, and Prof. Ramesh Rao, the director of the Qualcomm Institute. This memorandum was established to promote academic collaboration between Cygames and CREL to create an x-reality (mixed, blended, augmented reality) lab for long-term basic research and shared instrumentation and to offer innovative content to entertain game players worldwide. Together, Cygames Research and CREL will collaborate to create artificial intelligence (AI) technologies that can be incorporated into Cygames’s game titles, as well as joint research focusing on mixed reality technologies that utilize smartphones and deep learning technologies for computer-generated/sound media. The collaboration will also include joint seminars and research conferences, publications and mutual visits. CREL focuses on grassroots creativity and learning while promoting research that combines artificial intelligence with interactive and participatory media to allow people to be more creative, informed and make better decisions in educational as well as entertainment environments. CREL’s researchers comprise of UCSD faculty across all divisions on campus, including the arts, engineering and social sciences. CREL has supported graduate student research through UCSD Graduate division and research gifts from industries and academic organizations. Cygames Research is a research institution that was established to help meet the technical challenges of the Cygames mission to be the best in entertainment. The institution cooperates with a variety of public, private, and academic entities to advance technologies that will impact the entire games industry and society at large. Aiming to position itself as a leader in next-generation information technologies, Cygames Research publicizes its research in Japan and beyond.